Dubrovnik is a city of long history, fascinating culture, and great popularity, which joined the UNESCO list of World Heritage sites in 1979. It’s also a food and wine heaven! Let’s see what wonderful tastes you can enjoy in Dubrovnik on your tour to Eastern Europe. Dubrovnik has a many centuries old, extraordinarily delicious cuisine. Some dishes are similar to those of the coastal region, but there are quite a few dishes you can eat only here. You can try many home-grown condiments, traditional dishes, local cheeses, truffles, local prosciutto, grilled fish, fish stew and meaty stews – all seasoned with tasty olive oil, garlic, parsley, rosemary, basil, etc. You will enjoy top wines with your meals, and sweeten the experience up with delicious traditional desserts. Olives are an inseparable part of the history and culture of the Dalmatian region. The products of the olive tree are used as food, oil, medicine, animal feed, in cosmetic products, etc. Some olive trees here are a thousand years old, while the oil extraction process is the same since the Roman era. Mušule na buzaru, or stewed mussels, is the favourite dish of many locals and travellers. Buzara is a seafood cooking method, where mussels, clams, shrimp, or scampi are cooked with white wine, garlic, parsley, and breadcrumbs. Some tomato paste may be added. You can also simply order a delicious, always fresh, seafood platter or some grilled fish. Another dish you ought to try is Crni rižot, or black risotto, a classic Dalmatian dish, the black colour of which comes from the squid’s ink, but other seafood, like mussels and clams, are also added. Fresh oysters are a must while in Dubrovnik. They’ve been put on people’s tables from the seabed of Mali Ston Bay for centuries and are superb. However, if you don’t feel like eating seafood, how about some Zelena menestra, or green stew? This dish, made with different types of meat, potatoes, and cabbage, is first mentioned in writing in 1480, and you can’t eat it anywhere else in the world. With your meals, Croatian top quality wines are highly recommended. You must try red wines, such as Dingač, made on the Pelješac peninsula, or Babić, typically from Šibenik and Primošten area. If you prefer white ones, try famous Korčula wines, such as Grk or Pošip. Rozata, a custard pudding, is the most popular dessert in Dubrovnik, while the Ston Cake has been made for centuries, especially for celebrations like weddings, Christmas, Easter, etc. Arancini or Orancini is another traditional dessert and it’s candied orange peel. Candied lemon peel is called Limuncini. Even the Romans loved to bring these sweets to their friends as gifts. 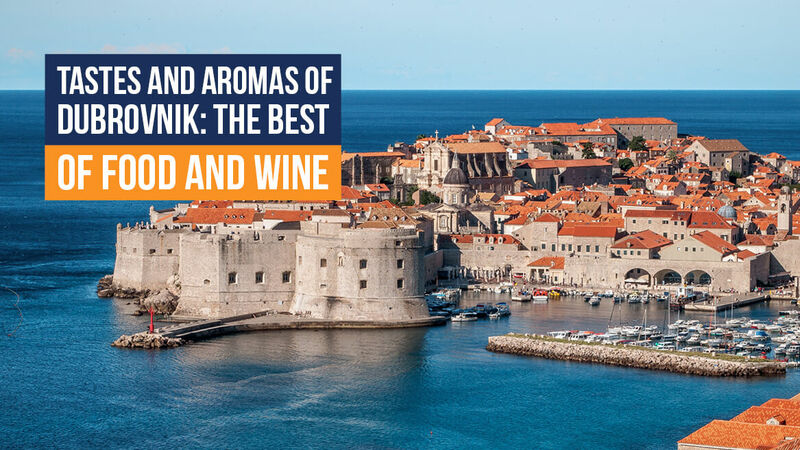 After talking about a few (of numerous) wonderful dishes and wines you can taste in Dubrovnik, let’s take a look at some of the places you must include in your food adventure. There is no better place to try the local specialties than at a Croatian restaurant in the Old Town. Besides the fabulous dishes we already mentioned, you get to taste many more, while enjoying the taste of local beer and wines, or non-alcoholic drinks and many types of coffee. While there, make sure to visit the bustling open-air market Gundulićeva poljana, where you can buy fresh seasonal fruits and vegetables, as well as local olive oil, liqueurs, and brandies. You will find here many hand-crafted souvenirs and various gifts, such as the famous Orancini and Limuncini, candied almonds, dried figs, lavender sachets, etc. If you feel like relaxing while enjoying some fantastic sights, then take the cable car to observe the Old Town, or go to the Buža café bar, which sits on the cliffs above the Adriatic Sea. Unwind here with a cold drink and some snacks. You can also take a swim, or even a dive from the cliff known as “the lion”. After a fun day in the Old Town, take a cooking class in Kameni Dvori in the Konavle area, the southernmost part of Dubrovnik Riviera. You will be welcomed with a drink and snacks. All dishes, including bread, are made without modern kitchen appliances, using a fireplace and water from the local well. All the ingredients are home-grown as well. You will taste many types of vegetables, breads, cheese, meats, as well as wine and other drinks. At the end, you will have some wonderful cake and Turkish coffee. Finally, go to the open-air market in Gruž. This is a lively market, preferred by locals, where people get fresh ingredients for their dishes, especially fish. You can also buy organic vegetables, local olive oil, various cheeses and antipasti, homemade spices, etc. Merchants from many other places come here too, so you can buy vegetables from Herzegovina, fish from the Elaphites, and many other foods and spices from various regions.